Nurettin Kılıçdoğan has been in prison for more than a year, sentenced for over 6 years. His crime? Encouraging workers to join Tümtis, the transport trade union for which he was branch president in the Turkish capital Ankara. Trade unionism is totally legal in Turkey, but his attempts to recruit union members were branded as an attempt “to establish a crime organisation…to recruit members to this crime organisation and being president of this crime organisation”. Several courts have backed Nurettin’s original unjustified conviction, and sadly this case is just one of many that revel an increasingly oppressive reality in Erdogan’s Turkey – four of his fellow Tümtis activists are also still in jail. 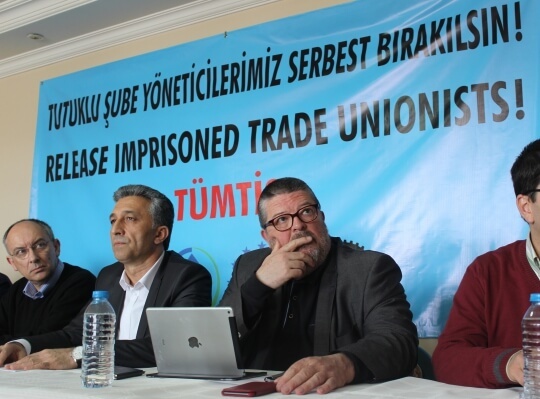 A delegation from the European Transport Workers’ Federation (ETF) and the International Transport Workers’ Federation (ITF) tried today to visit Nurettin inside the high-security prison where he is being held. However, our request was refused by the government, just as happened on an earlier visit. It is clear that Nurettin’s imprisonment is utterly unjust. The ETF and ITF demand his immediate release, and the release of his four colleagues. The attempted visit is part of a four-day mission to Turkey which includes support for a strike and picket line by DHL Express employees in Istanbul and meetings with all ETF and ITF affiliate unions in Turkey. Check out #TurkeyMission18 for more.